Easy, cheesy, beautiful cheese pulls. Maybe she's born with it, maybe it's baked gnocchi. It’s that time of the year when I start feeling like I really need some sun. I miss being able to walk outside without a coat and I sure as heck miss the sun. The one part of winter that I do love though, is the hearty, warming food. I’ll take any excuse to eat extra carbs and keeping warm is defintely a good excuse. 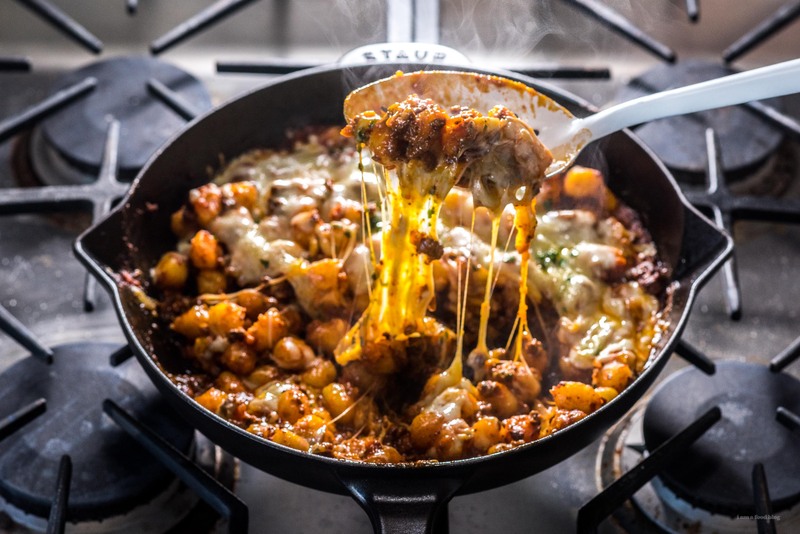 This extra cheesy baked gnocchi bolognese is perfect for cozying up. Bolognese will always and forever be one of my favorite sauces and if I have leftover in the fridge, I’m one happy girl. 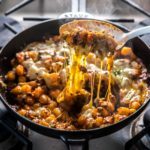 I included a quick bolognese recipe here, but if you have leftover sauce hanging out, this bolognese bake comes together even easier. 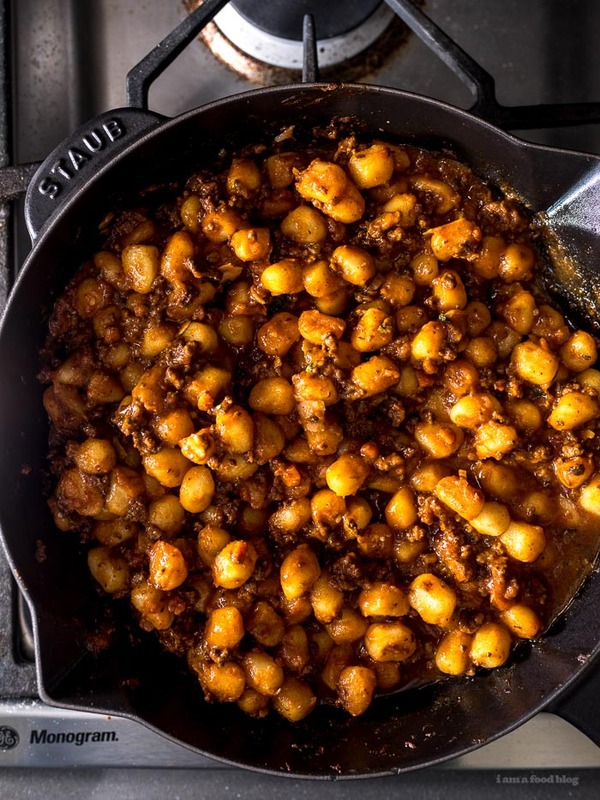 I’m pretty sure bolognese and gnocchi aren’t a classic Italian pairing – bolognese typically goes with tagliatelle and if not tagliatelle, then most definitely flat, long pasta shapes. 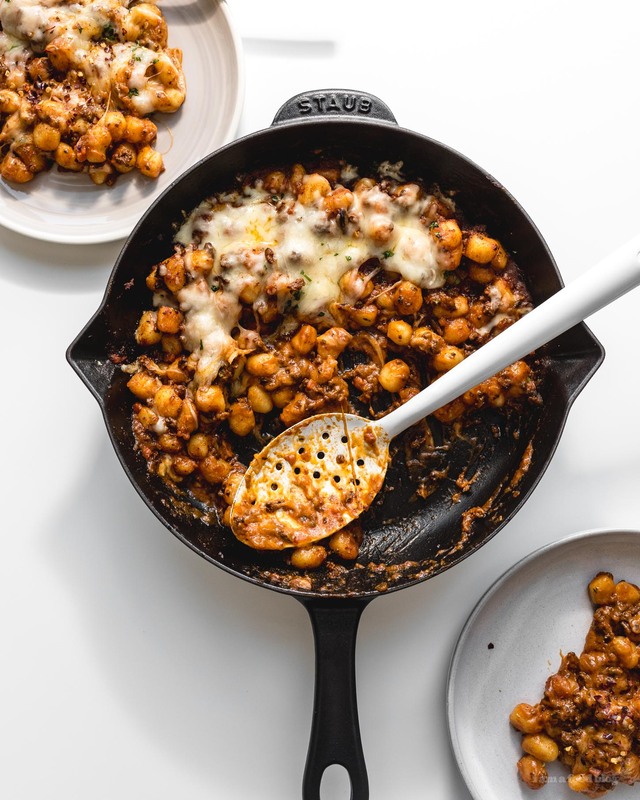 Still, there’s something about fluffy little potato dumplings and meaty ragu baked to saucy, cheesy perfection. I fried the gnocchi in a bit of butter so they’d have a nice crust to contrast the soft insides and also so they would hold up in the sauce. A little bit of an extra step, but worth it. Heat the butter and oil over medium heat in a deep skillet or pot. When hot, add the onion, carrot, celery, garlic, and half of the parsley. Cook, stirring, until the vegetables are soft, but not brown. Add the meat to the pot and cook, breaking up and browning. Add the wine and cook it down until it is mostly evaporated. Stir in the crushed tomatoes, tomato paste, milk, and bay leaf. Simmer until slightly thickened, about 20 minutes. Give the sauce a stir, then add 1/2 tablespoon of fish sauce and taste, adjusting with salt and pepper as needed. In another oven safe skillet, heat up the butter over medium heat. Add the gnocchi and pan fry, turning as needed, until golden, about 3-4 minutes. 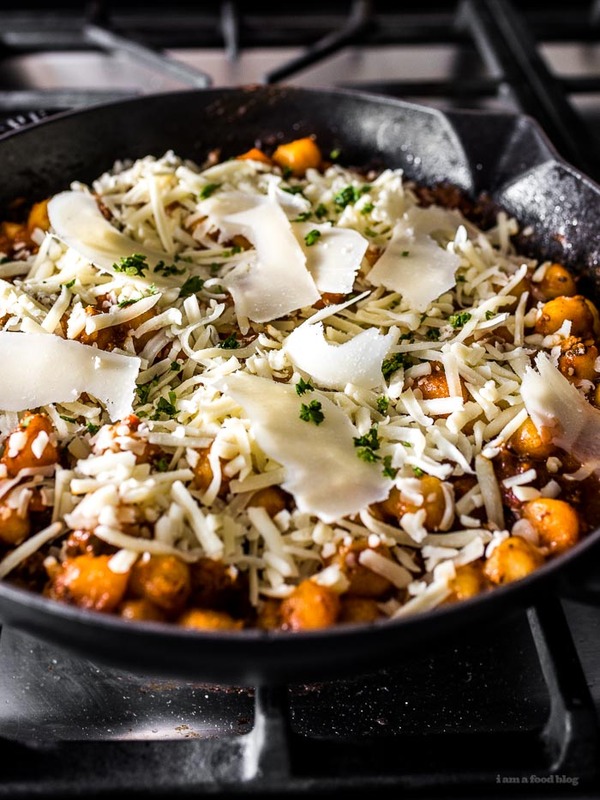 The gnocchi will continue to cook in the sauce as it bakes in the oven. Add the bolognese sauce to the skillet (you might have a bit extra) and stir to combine. Top with the shredded mozzarella and shaved parmesan, if using. Bake for 20-30 minutes, or until cheese is melted and sauce is bubbly. Enjoy! Oh my God Steph! I am drooling just looking at your pictures. This looks amazing! ERMAHGERD. This is my exact comfort food recipe! 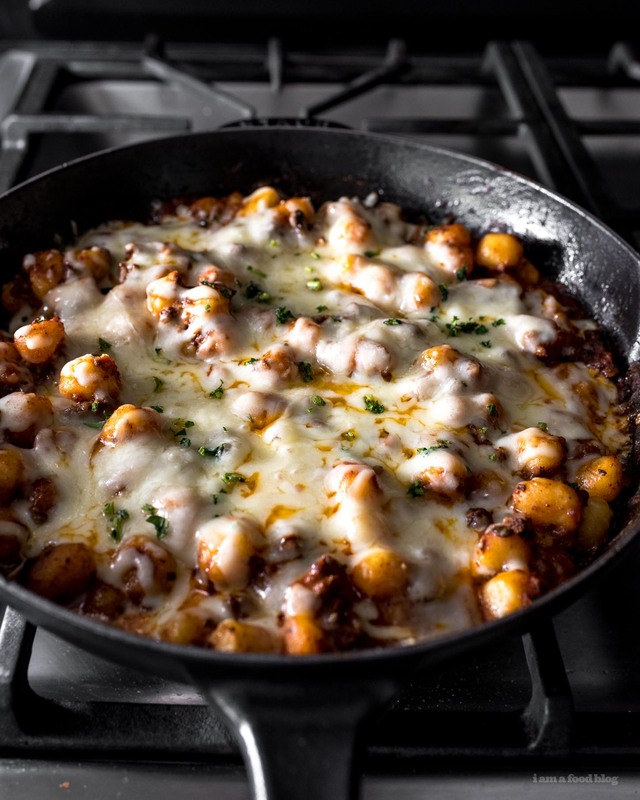 Baked gnocchi is all I crave in the winter. Great recipe! Hi, this looks amazing! I’m a little confused tho – it says that I need one batch of the Bolognese sauce as part of my ingredients but it looks like the ingredients first listed is to make the Bolognese. Is it just listed twice? TIA!